The 2015 Baltimore Orioles season was the 115th season in franchise history, the 62nd in Baltimore, and the 24th at Oriole Park at Camden Yards. They were attempting to defend their 2014 AL East title, but were eliminated from the division title race on September 23, 11 1⁄2 games back from Toronto. They were entirely eliminated from the postseason on September 28, 6 1⁄2 games back from Houston for the second AL wild card spot. They finished the season .500, their 4th straight non-losing season under manager Buck Showalter. The one bright spot in an otherwise disappointing season was first baseman Chris Davis winning the MLB Home Run Championship with 47, the third consecutive year in which the crown was won by an Oriole after Davis in 2013 and Nelson Cruz in 2014. Third baseman Manny Machado was the only player in the majors to play all 162 games, a reassuring feat after Machado had missed significant portions of the preceding two seasons due to knee injuries. 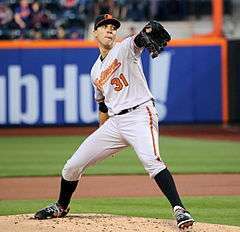 Ubaldo Jiménez pitching against the New York Mets. October 30: Alexi Casilla, Johan Santana, Andrew Miller, Kelly Johnson, Nelson Cruz, Joe Saunders, Nick Markakis, and Delmon Young entered free agency. Delmon Young would be the only one to re-sign with the team on January 9. The Orioles sent Pat McCoy to the minors on December 8. November 1: Nick Hundley entered free agency. He signed with the Colorado Rockies. Week of November 18: Signed 12 players to a minor league contract, and promoted Tyler Wilson and Mike Wright from the minors. They also signed free agent Oliver Drake. November 26: Signed Rey Navarro and receive Scott Barnes from the Cleveland Indians in exchange for cash. December 3: Signed Eddie Gamboa from free agency. December 11: Drafted Logan Verrett and received Jason Garcia from the Houston Astros in exchange for cash. December 15: Gave Jesse Beal, Chaz Roe, and Matt Tuiasosopo a minor league contract. December 19: Signed Wesley Wright. The Orioles sent Lavarnway to the minors on January 16. December 24: Signed Cesar Cabral to a minor league contract. January 5 – 21: Signed 7 players (including J. P. Arencibia) to a minor league contract. January 23: Received Hector Daniel Rodriguez from the Braves for cash. January 27: Received Travis Snider from the Pittsburgh Pirates and gave them Stephen Tarpley and a player to be named. Also designated Mike Ohlman for assignment and signed 3 players to a minor league contract. The St. Louis Cardinals received Ohlman for cash on February 3. January 29: Signed Brad Duffy to a minor league contract. February 2: Signed Julio Borbon to a minor league contract. February 3: Traded Steve Lombardozzi, Jr. to the Pittsburgh Pirates for cash. Also traded Mike Ohlman to the St Louis Cardinals for cash. February 10: Signed former Oriole free agents Mark Hendrickson and Nolan Reimold to minor league contracts. February 11–17: Signed four players (including Jayson Nix) to minor league contracts. February 20: Sent Steven Brault to the Pittsburgh Pirates as the PTBNL in the Travis Snider trade. February 25: Signed free agent Everth Cabrera and designated Alex Hassan for assignment. The Oakland Athletics claimed Hassan off waivers on February 27. The team's April 29 home game against the White Sox became the first in MLB history to be played without a paying crowd, as safety concerns over the ongoing 2015 Baltimore riots led the team to play with the stadium closed to the public following two postponed games. On June 16, the team broke a franchise record by hitting 8 home runs against the Phillies. On June 28, the team swept a doubleheader against the Indians, 4-0 and 8-0. It was the first time an O's team had won both ends of a doubleheader by shutout since 1974. 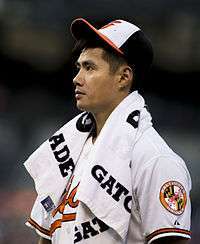 On August 12, Seattle Mariners pitcher Hisashi Iwakuma threw a no-hitter against the Orioles. On August 16, the Orioles tied a franchise record with twenty-six hits in a single game in an 18-2 victory over the Oakland Athletics. This was also the first time in Browns/Orioles history the team had scored 18 runs or more three times in a season (18-7 over Boston on 4/26 and 19-3 over Philadelphia on 6/16). On October 3, the team swept a doubleheader against the Yankees, 9-2 and 4-3. It was the second time the O's won both ends of a doubleheader this season. — April 27 White Sox Postponed (safety concerns due to the 2015 Baltimore riots). Makeup date May 28 as part of doubleheader. — April 28 White Sox Postponed (safety concerns due to the 2015 Baltimore riots). Makeup date May 28 as part of doubleheader. — June 27 Indians Postponed (rain). Makeup date June 28 as part of doubleheader. — September 21 @ Nationals Postponed (rain). Makeup date September 24. — September 29 Blue Jays Postponed (rain). Makeup date September 30 as part of doubleheader. — October 2 Yankees Postponed (rain). Makeup date October 3 as part of doubleheader. 1 2 3 Games moved to Tropicana Field for safety concerns due to the 2015 Baltimore riots. ↑ "MLB Transactions". MLB.com. MLB.com. Retrieved February 4, 2015. ↑ White Sox-Orioles game postponed – ESPN.com. Retrieved April 27, 2015. ↑ Encina, Eduardo. "Orioles postpone tonight's game against White Sox". baltimoresun.com. The Baltimore Sun. Retrieved April 28, 2015. ↑ Allen, Scott. "15 questions about the Orioles-White Sox game that no fans can attend". washingtonpost.com. Retrieved 29 April 2015. ↑ Encina, Eduardo. "O's make unprecedented scheduling changes following riots". baltimoresun.com. The Baltimore Sun. Retrieved April 28, 2015. ↑ Leventhal, Josh, ed. (2015). Baseball America 2016 Almanac. Durham, North Carolina: Baseball America. ISBN 978-1-932391-60-2. Wikimedia Commons has media related to 2015 Baltimore Orioles season.